Total mind and body wellness is one of my goals for 2019. It's no secret that I've struggled with health and wellness in years past, but my last checkup in December showed positive signs that I am on the right path for a healthy future, so I want to do all that I can to help promote an overall sense of well-being this year and continue the momentum. I've added in more Mediterranean diet approved foods into my meal plan to nourish my body, started self-teaching myself Spanish to improve my mind, and have upped my intake of Celestial Seasonings Wellness Teas to complete the welfare of my overall health. 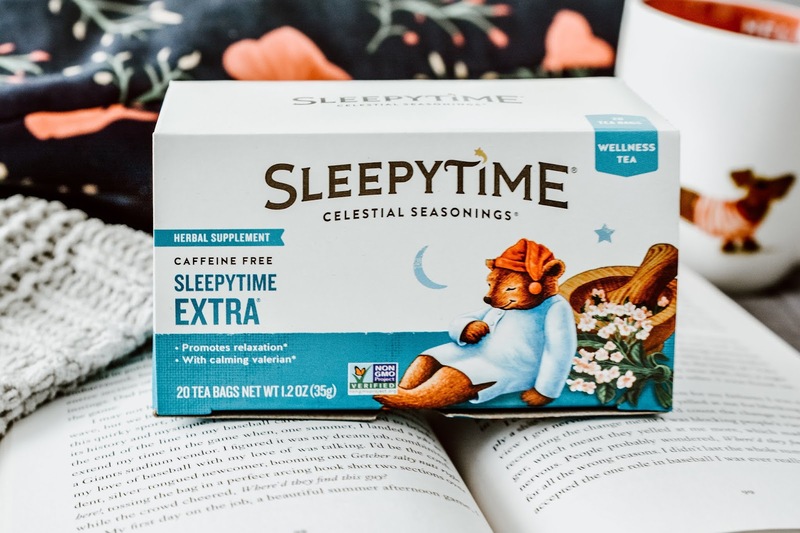 Adding Celestial Seasonings Sleepytime Teas to my daily routine helps keep me on track to meet my 2019 goals. Where I used to rush around all day feeling stressed trying to get everything done, adding in a steamy mug of tea helps remind me to slow down and just take a minute to relax and breathe. Falling asleep quickly used to be a struggle for me, but I have learned that if I crawl into bed at night with a good book and a hot cup of tea, I can always calm my mind and body resulting in me falling sound asleep within minutes of turning out the lights. A good night's rest always sets one up for a productive day. For my bedtime routine, I have stocked up on a variety of Celestial Seasonings Sleepytime Tea. Sleepy Time Extra promotes relaxation by being caffeine-free, and does not contain artificial colors, flavors or artificial preservatives. 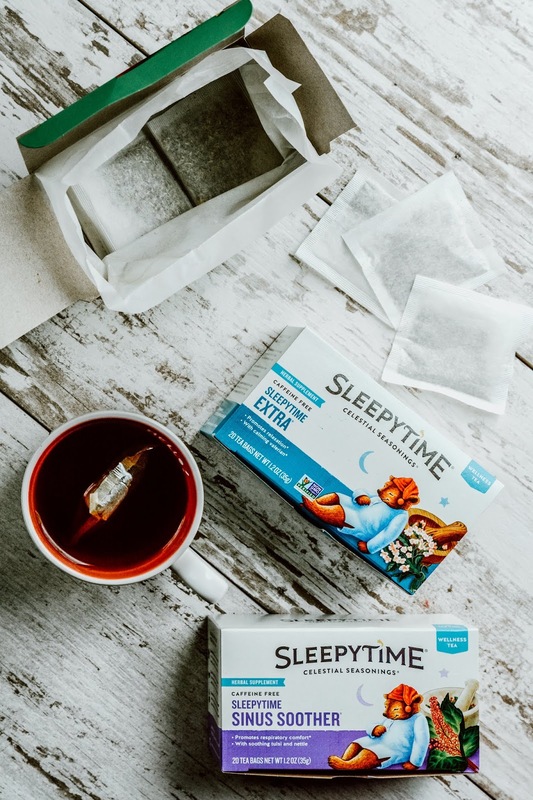 Sleepytime Detox promotes natural cleansing, is also caffeine-free, and does not contain artificial colors, flavors or artificial preservatives. 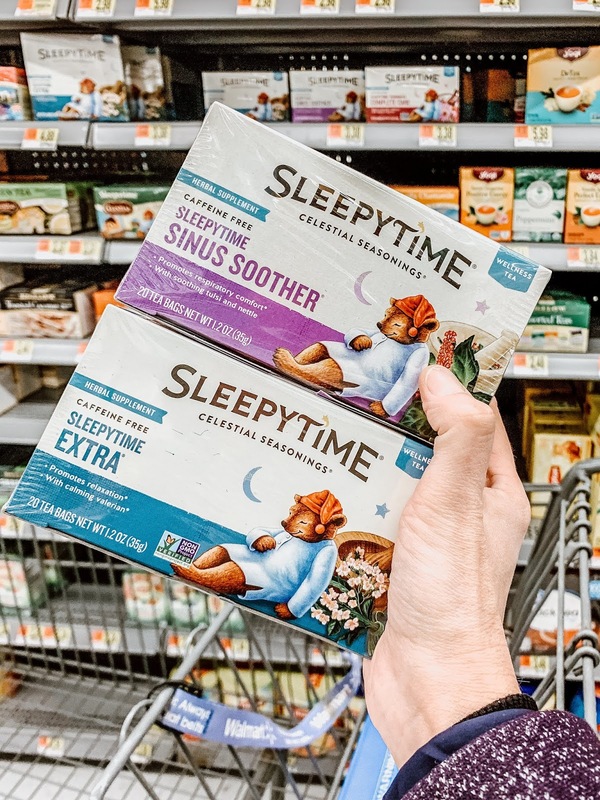 Sleeptime Sinus Soother promotes respiratory comfort with it's uplifting menthol flavor and aroma. It is also caffeine-free, and does not contain artificial colors, flavors or artificial preservatives. What I also like about Celestial Seasonings tea is their dedication to sustainability. The tea bags are stringless and come packaged in recycled boxes. These are both great things for lessening our carbon footprint! Whether you are looking for healthy alternatives to sugary drinks or you want to add a few nighttime steps to ensure a good night's rest, Celestial Teas has you covered. You can find a wide variety of flavors at your local Walmart store, where you'll notice they cost significantly less than their competitors. And, to help keep stress down even more, the tea is available for online grocery pick-up, so you can place your order online, then have it ready to be picked up at your convenience! If you're looking for more ideas to promote your overall well-being, be sure to check out all of the Celestial Seasonings tea varieties to find your new favorite. Share what you're sipping on social media using the hashtag #LiveFlavorfully. Do you read before bed? What are you currently reading? I love their teas. I use them all the time, in fact. I'm a firm believer that nature can keep you healthy if you just use a little common sense and do right by your body. Yes, I subscribe to that belief as well! Sometimes I read and other times just watch an episode of something and then off I go. As long as I don't nap, can sleep pretty fast. Helping with sleep is a win indeed. If I watch a show before bed, my mind races, so we had to remove the t.v. from our room. Love the sleeping bear on the box :) and love your nightlamps! So happy that your health is getting better, dear, we couldn't wish for anything better this year! I've also switched a lot from fruit teas and green ones to healthy ones, that you call tisane, right? During the week I switch from camomile to nettle, elderberry, linden, dandelion, and we also have nine herb tisane which has all of the healthy herbs in one. But I do still drink my black tea in the morning, that's a law. Isn't that bear so cute? I am super relieved over my health as well. You know it's been a constant battle for me for the past 4 years. Yes, they are called tisane, but mostly we just call them herbal teas. I also have to always have a black tea with my steel cut oats every morning. I do a fruit tea for lunch (usually blueberry, pomegranate, or wild berry), then Sleepytime for bed. How are your shutters working for you? I read blogs before bed. Right now I'm reading Isaak "An Indian in the Cupboard". Travis thinks I'm nuts, reading to him when he can read. I'm just trying to have a positive learning some-thing-or-rather in his life, since his teacher is lame. I love tea and coffee. I drink 1 cup of coffee in the morning, a 1 or 2 cups of tea at night. The Sleepy Time tea is what I have. I think that's great that you still read together. Such a lovely way to bond! Hi, Theresa! I'm definitely familiar with Celestial Seasonings teas. My Great Uncle Stan introduced me to their Red Zinger tea decades ago. I have no idea how an elderly man in Nova Scotia came across that tea in the mid-70s, but he did and he loved it. I never forgot it because of the name and because it was a tea I actually liked. At that time I had no clue my future would be in Colorado. The health goal I'm tackling right now is to improve my sleep by sleeping longer and by establishing a regular sleeping schedule. I've started a bedtime routine of making ~ no lie! ~ Celestial Seasonings Sleepytime Tea at 9:00 pm for my husband and me. I drink my tea and read until 10:30, and then it's off to bed. I'm currently reading a sci-fi novel, "Abaddon's Gate." It's the third in a fabulous series. I'm a coffee lover, and I've tried a lot of teas in an attempt to find some I like. I keep coming back to Celestial Seasonings. Gotta run, it's 9:00, and my kettle is boiling! Have a good one! I have heard of these teas before and have always wanted to give them a try. I love that they have so many different types for wellness! These teas work wonders for me! It's been a while since I've needed help falling asleep, but these are a great way to settle in for the night. I don't have any issues falling asleep but my husband does. He tosses and turns which is reason enough for me to lose sleep too. I will get these teas for him. Maybe (and hoping) it will help. I would love to try out Sleepy Time Extra. I have been very restless recently and I am sure the relaxation aspect would be helpful for me. Tear can really come in handy when you're looking to get a good night's rest. I haven't looked into this before, will do some research. I think this is the best solution to my current dilemma. I am physically tired but no matter what I do, I can't fall asleep. I have to get those teas soon. Losing sleep is not healthy at all. I'm such a terrible, stressful sleeper. I could really use this to help calm my mind and energies before I go to sleep.. and hopefully maintain a good sleep throughout the night! I am starting to love tea. I love tea that are calming. I love Sleepytime Celestial Seasonings tea! My kids and I drink the different varieties all of the time. I love this brand! I always drink it during bed time and it relaxes me. I hope I can try other variants too soon. I didn't know they had a sinus soother. That would be good for my mom!